D: How is the Guru found? M: God, who is immanent, in His grace takes pity on the loving devotee and manifests Himself according to the devotee’s development. The devotee thinks that He is a man and expects a relationship as between two physical bodies. But the Guru, who is God or the Self incarnate, works from within, helps the man to see the error of his ways and guides him in the right path until he realises the Self within. D: What should the devotee do then? M: He has only to act up to the words of the Master and work within. The Master is both ‘within’ and ‘without’, so He creates conditions to drive you inward and at the same time prepares the ‘interior’ to drag you to the Centre. Thus He gives a push from ‘without’ and exerts a pull from ‘within’, so that you may be fixed at the Centre. D: How can the silence of the Guru, who gives no initiation nor does any other tangible act, be more powerful than His word etc.? How is such silence better than the study of scriptures? M: Silence is the most potent form of work. However vast and emphatic the scriptures may be, they fail in their effect. The Guru is quiet and Grace prevails in all. This silence is more vast and more emphatic than all the scriptures put together. 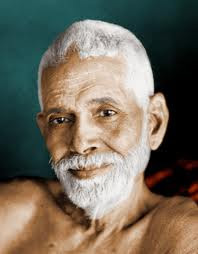 D: But can the devotee obtain happiness?